William M. Johnson was my maternal uncle, who joined his wife of 62 years, Carm, when he passed quietly on December 30, 2010. He was 88 years old, and a treasure to me who, over these past four years, shared a rich and detailed view into my family's history. His perspectives and memories of his generation's era are invaluable. Bill led a charmed life. He was a Depression-era child in Rock Island and fondly recalled how he used to join dozens of neighbors hunting worms at night in Longview Park so they could fish for their suppers from the Mississippi. Decades later he retired from Deere & Company, having served for 36 years as executive pilot, coming on board at the genesis of Deere's aviation department after World War II. Bill is survived by two sons and daughters-in-laws - Bill and Neva, and Tom and Kathy - 16 grandchildren, and six great grandchildren. And me and my husband, Todd. We could not have loved him more. Bill worked for the Rock Island Argus as a paperboy and then as a teenager in the press room, lied about his age to get his next job as a surveyor on a barge line, and finally secured a job on the Rock Island Arsenal to save up enough to go to Augustana College. He attended only a semester before enlisting in the the U.S. Army Air Corps for service during WWII, pursuing his dream to be a pilot. He was a fighter-pilot trainer, flying P-51s for the most part, off the coast of North Carolina during the war. It was during the months before deploying that my exceedingly handsome Uncle Bill met the girl of his dreams, my gorgeous Aunt Carmella Wieckhorst, whom he married in 1944. A stunning couple, she was his life mate for 62 years of marriage that stood the test of time with unshakable devotion to one another. After the war, many pilots were going to work for the burgeoning commercial airlines. Bill came back to Rock Island and took a job as a time keeper on a production line at the Arsenal. Much too idle of a role, Bill sought out more flying gigs that included stunting at some of the first air shows in the region. One day, he saw a plane with the name John Deere on the side. "I didn't know who John Deere was, but I knew he had a plane with his name on it," Bill would say, grinning from ear to ear. He had previously gone to International Harvester and tried to convince them that they needed an aviation division, to no avail. 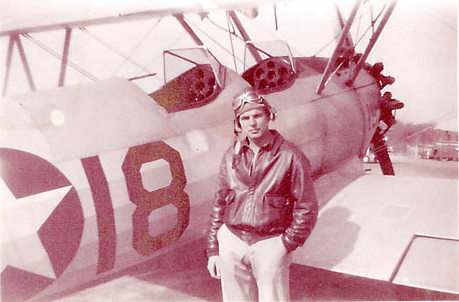 Deere was one of the first companies in America investing in an aviation department, and Bill was the second pilot hired by Deere's Colonel Wieman. Bill was a wonderful storyteller. He often recounted his flying experiences for Deere, such as being sent out to select and fly back air-force surplus trainers to be added to the fleet, or landing on Lake Michigan and parking the plane on the sidewalk next to Buckingham Fountain. Decades later his missions would include flying jets across the globe, including the first American corporate flight into China. He had story after story about his career, from delivering a young VP (who would expand Deere internationally) to his chairmanship-appointment meeting to flying such notables as Truman Capote and Dwight Eisenhower. Bill had a marvelous sense of humor, and his stories were rich with detail and insight into the players of the day, a group he respected for their abilities and vision. It was exciting to get a glimpse into the dynamics of a global company's executive lifestyle, something Bill always appreciated being a part of. Despite this high flying career, Bill's feet were firmly on the ground, rooted in down-to-earth convictions that were plain to all who knew him. And always his stories circled back to his admiration of Carmella. My one regret is not knowing her, too. Thanks to my grandmother, I have a a lot of knowledge regarding my paternal roots. Now, thanks to my uncle, I can claim the same for my maternal heritage. My mother, Bill's only sister, passed in 1991, so having the opportunity to learn more about her, my grandparents, my cousins, and a long list of other relatives through Bill's eyes has provided me a timeless connection to them all. He was infinitely proud of his two boys, saying time and again that he could not have asked for better sons. By sharing his memories and many feelings, he provided to me precious gifts of identity, place, and belonging that only family elders can impart. And it was contagious, because it drew my husband to him in ways that Todd will also cherish forever. For the past four years, upon the death of Aunt Carm, Uncle Bill and I forged an uncommonly beautiful bond as he struggled to cope with the unbearable loss of his beloved wife. Bill loved to sing and had a memory for details that was amazing. All we had to do was turn on the oldies station on the cable music channel and one song after another would prompt story after story. We often found ourselves looking up history on the Internet to fill in the gaps, and watching online videos of the crooners from his era. This reminiscing gave him comfort, allowing him to celebrate the life he knew he was fortunate to have lived. Bill was solid as a rock. He knew himself and what he valued, and he lived his life accordingly. Simple. Honorable. He flew all over the world, with passengers most of us only dream of meeting, yet he had not a single pretentious bone in his body. He treated all with equal professionalism and accord. Mostly, though, Bill was a gentleman who adored his wife. All who knew him know that his heart was broken when my aunt passed. Yet he persevered, despite a sense of loss that only occurs where love is greater than ourselves. My Uncle Bill and Aunt Carm boasted a real-life love affair that lasted 62 years and beyond. If I am left with nothing else, their legacy of enduring love, passionate and unconditional, for over a half century stands as testimony to what is possible between two people who dare to love that much. Again, a gift beyond value. I marvel at how I could live 50 years having an uncle so charismatic and full of good humor, but know him so little. Then in what seems like the blink of an eye, I have a heart bursting at its seams for love of him, his character, his wit, and his familiar ways. We spoke daily and became best friends in ways so natural and comfortable - laughing, crying, arguing over generational differences, but always with tolerance and respect for the other's views. Family bonds seem to transcend the usual obstacles that keep people from becoming close. From the beginning, there was instant understanding, forgiveness when needed, and easy compromise on things usually harder fought. I salute my uncle, Bill Johnson, and thank God for providing Todd and me with the privilege to know him in the winter of his life, and to grow so exponentially from this experience both in love and appreciation of the exceptional people who compose my particular clan.